We offer Powerflex bushes across most of the Alfa Romeo range. 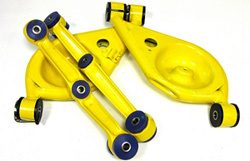 Specific jobs that we routinely use Powerflex for are GTV & Spider rear suspension bushes, 156/147/GT front anti roll bar & upper wishbone bushes, and 159/Brera/Spider lower (rear) and upper wishbone bushes. We also work with Powerflex to help develop and improve these products.